Siuslaw National Forest, Oregon. Photo by Einahpets32, used under Creative Commons licensing. Post co-authored by Jim Furnish, reposted from the Mail Tribune. One of us is a conservation scientist and the other is former deputy chief of the Forest Service and Siuslaw National Forest supervisor. What we share in common is a love for the great outdoors, our families, and having been intimately involved in the Northwest Forest Plan (NWFP), which in 1994, shifted management of 24 million acres of Forest Service and BLM lands from timber dominance to ecosystem management. Back when we were launching our careers in the 1980s, majestic old-growth forests from redwoods to Olympic rainforests were being clearcut at about 2 square miles a week. Iconic salmon runs were crashing, bellwether species such as the spotted owl were circling the extinction drain, and the regional economy was on a collision course with nature. Without the NWFP, older forests, outside of a few parks and wilderness areas, would have been liquidated this decade. Thanks to the NWFP, streams are recovering, deforestation has slowed dramatically on public lands, and the region’s forests are doing their part to stymie global warming by soaking up atmospheric carbon dioxide. In sum, if it ain’t broke, don’t fix it! But some say that the embattled spotted owl is still headed to extinction, protective stream buffers should be chopped in half to restart logging, and the plan is not meeting timber targets. To this we say that the NWFP is a century-long plan that is only in its second decade. Because 40 percent of the “old-growth reserves” started out as recovering clearcuts, the forests need more time to become spotted owl habitat. If anything, stream buffers should be widened to absorb flash floods from an anticipated future of intense winter storms. And Congress typically authorizes up to 700 million board feet of timber annually for the NWFP region — that’s more than enough log trucks to stretch the entire length of Interstate 5 if parked end-to-end! Conservation groups have supported much-needed thinning in overstocked plantations as an alternative to old-growth logging. Two decades of forest monitoring has shown that federal forests are a wellspring of clean water. BLM lands in western Oregon, for instance, supply nearly 2 million residents with drinking water. In contrast, the alarming decline of snow pack in the Northwest in the last few decades may soon make water rationing a likely climate change hangover, as California is now facing. Logging on steep slopes and road building only magnify these problems by polluting streams with sediment runoff. Repairing or decommissioning failing roads, replacing outdated culverts, and protecting fish-bearing streams are the NWFP’s sound climate change measures. Oregon’s older forests also store more atmospheric carbon per acre than nearly any forest on Earth. When these forests are cut down, about half of their stored carbon is released as carbon dioxide, a global warming pollutant. To help reduce carbon dioxide pollution from logging, private landowners that practice stewardship can now sell carbon credits to developers seeking to offset global warming pollution. Climate change also may trigger an increase in forest fires. Thus, we need to responsibly prepare forestlands and homeowners for this new reality. Based on decades of fire monitoring, plantations, with their dense young trees, burn with unnatural intensity in forest fires. This is only made worse by “salvage” logging that strips the burned forest of its capacity to rebound from fire. Large dead trees left behind by fires are legacies for new forest growth. They shade seedlings from intense sunlight, anchor fragile soils, and provide habitat for insect-eating bats and birds. In contrast, industrial logging transforms natural forests into ticking firebombs as slash piles up in clearcuts. The 2014 Douglas (Douglas County) and Beaver fires (east of the Greensprings) burned primarily in industrialized forestlands. The 2002 Biscuit fire near Cave Junction burned hottest in areas previously salvage-logged. Thinning small, dense trees in flammable plantations and clearing vegetation nearest homes are responsible fire-risk reductions. Finally, the Siuslaw National Forest exemplifies how ending old-growth logging and focusing on restoration is a solution to timber wars. 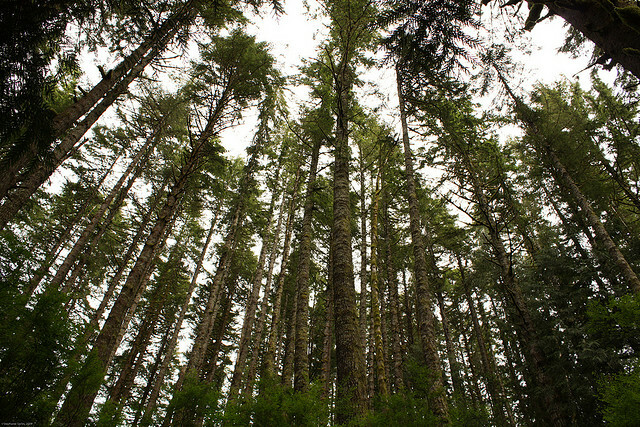 In 1994, then Forest Supervisor Furnish boldly moved the Siuslaw into plantation thinning. Today, that forest produces some 40 million board feet annually without a single appeal. The BLM and Forest Service should take note of this example as they revise forest plans. So, on this Earth Day, we celebrate the Northwest Forest Plan, take pride in the naturalness of our region as a magnet for diversifying economies, and remain optimistic that our children will inherit from us a region teeming with wild salmon, verdant old-growth forests, clean water and a safe climate.